Part 1 – Deploying a single server solution. Although it is called a single server installation, we will need 2 servers as shown below. And a certificate. I got mine for free from https://startssl.com. This certificate needs to contain the FQDN you will use as the RD Web Access URL (mine is gateway.it-worxx.nl in this guide). It needs to be in .pfx format and you need to have the private key in it. This guide will not focus on building a domain using a single domain controller and adding the second server as a member server to this domain. Also some basic knowledge is assumed in this guide. I will not detail how to create a Security Group and adding a computer account to it. I will also not detail how to install SQL Express, or adding logins to a SQL Server Instance security context. If you need extra help with this, Bing it or drop me a mail with details, and I will provide steps to continue. Log on to the Domain Controller, and in Server Manager right-click the All Servers node and add the second server using the Add Servers command (or select the All Servers node, click Manage and click Add Servers). 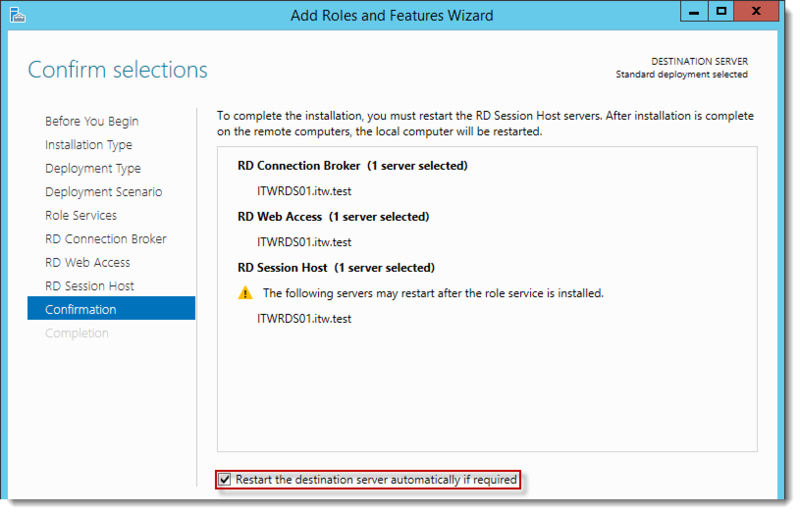 Although Quick Start might be a valid option for a single server deployment, leave the default selected. 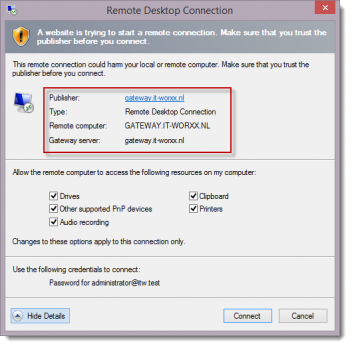 This will explain the steps necessary to install Remote Desktop Services in greater detail. Click the member server and click the Add button. 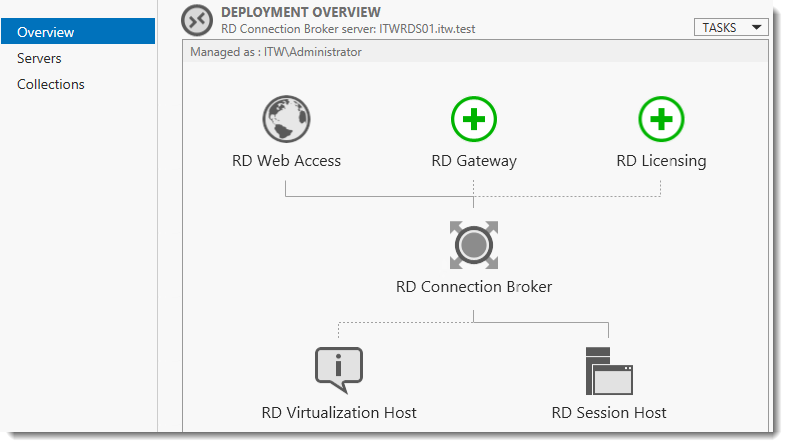 Check Install the RD Web Access role on the RD Connection Broker server. Wait until all role services are deployed and the member server has restarted. The wizard creates a self-signed certificate. We will deal with certificates in this deployment in a little bit. Enter the external Fully Qualified Domain Name which you will also use for the Web Access URL. In my case, for lack of a better name, I used “gateway.it-worxx.nl”. I didn’t want to use “remote.it-worxx.nl” or “desktop.it-worxx.nl” or anything else. Notice that “gateway.it-worxx.nl” was configured for the deployment. Also notice that even more certificate configuring is need, but we’ll get to that later. Pay no attention to it for now. Let’s have a quick look at the certificate configuration. 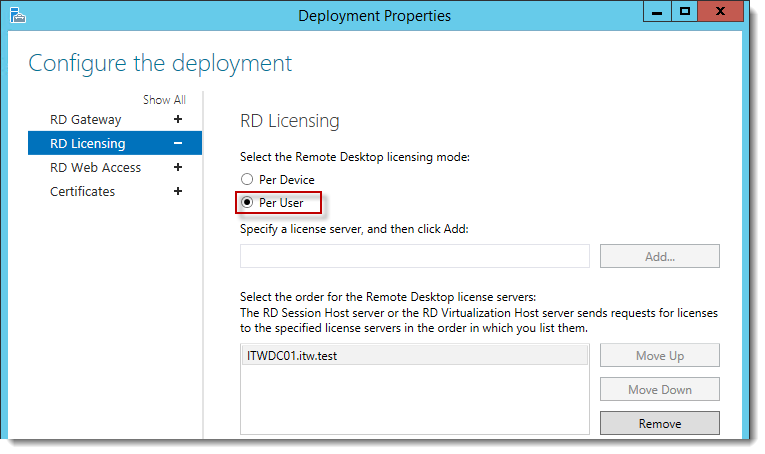 In Server Manager, Remote Desktop Services, Overview, click Tasks and click Edit Deployment Properties. I selected Per User, but since this is just a guide setup, it really doesn’t matter. Notice that the certificate level currently has a status of Not Configured. As you can see, certificates are used for different goals within the deployment. 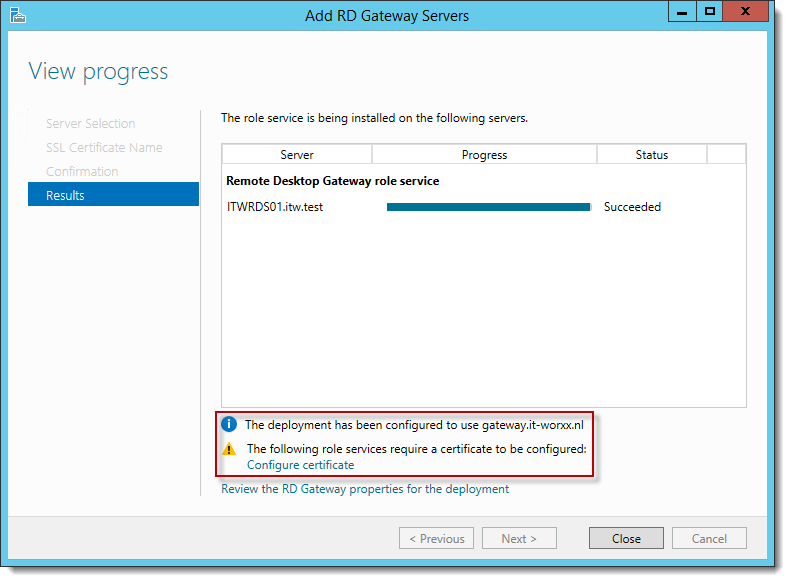 The RD Gateway certificate is used for Client to gateway communication and needs to be trusted by the clients. Either install the self-signed certificate on all clients, or use a certificate for which the complete certificate chain is already trusted by all clients. As it said in the wizard, the external FQDN should be on the certificate. The RD Web Access certificate is used by IIS to provide a server identity to the browser clients (and to the Feed clients, but that’s a subject for a future post). The RD Connection Broker actually has two goals for which it needs certificates. To enable single sign on (server to server authentication), and for publishing (signing RDP files). If you look in the deployment you’ll see that the Connection Broker is now configured to use “itwrds01.itw.test”, so we have to change it to use an external FQDN as well. If we use the same FQDN for all goals described above, we need only 1 certificate, and only 1 external IP address. We’ll come back to this wizard later to assign the certificate. First order of business is to change the internal FQDN for the Connection Broker to an external FQDN. Enter the external FQDN which will also be used by the Connection Broker. Leave the Name field blank, but enter the member server’s (holding the RD Connection Broker role) IPv4 address. Create a new Global Security Group called “RDS Connection Brokers” and add the computer account for the member server to it as a group member. Reboot the member server to let it know it’s a member of the RDS Connection Brokers security group. Now you see why I pre-configured the servers with the .NET Framework 3.5 feature before starting anything. Use the Default Instance (so click Default, and do not leave the wizard’s selection on Named instance: SQLEXPRESS). When the installation is done open SQL Configuration manager and browse to Client Protocols under SQL Native Client 11.0 Configuration. Check if TCP/IP is enabled under Client Protocols. SQL Express install enables this by default, but check it just to be sure, especially if you use an existing SQL Server. Browse to Protocols for MSSQLSERVER under SQL Server Network Configuration. Enable TCP/IP. If this is a new SQL installation, this will be disabled by default. 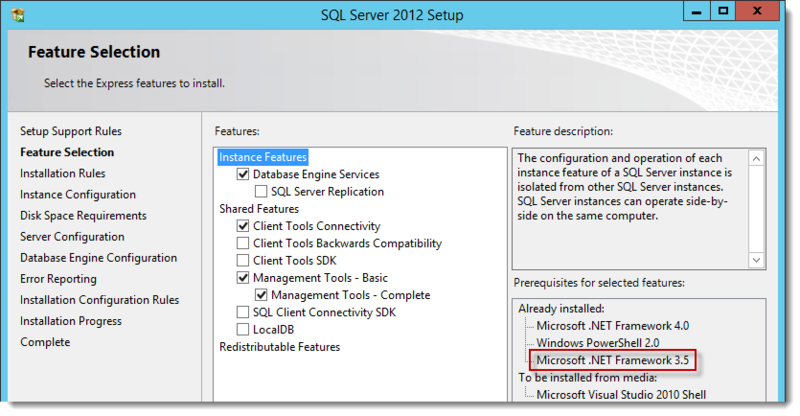 Restart the SQL Server service if you changed this setting. On the SQL Server, make sure port 1433 is not being blocked by Windows Firewall. I added the SQL Server executable to the exception list to allow all inbound traffic. Open SQL Server Management Studio and browse to Logins under Security. Click Object Types… and select Group. Type the RDS Connection Brokers security group name and click Check Names. Click Server Roles and select dbcreator. We have just effectively granted the RDS Connection Broker server the right to create databases. Install the SQL Native Client on the member server (Client Components only). Everything we need is now in place to convert the RD Connection Broker, so let’s do just that. If you have more than one RD Connection Broker they need to be configured using DNS Round Robin. More on that in a later post. In Server Manager, Remote Desktop Services, Overview, click Tasks and click Edit Deployment Properties, then click Certificates. Click RD Connection Broker – Enable Single Sign On and click Select Existing certificate. Browse to the .pfx file, enter its password, and check Allow the certificate.. So click Apply. This takes a little while, be patient. Click RD Connection Broker – Publishing and click Select Existing certificate. Click Apply. This again takes a little while, be a little more patient. Click RD Web Access and click Select Existing certificate. Note: Did you notice the warning when you select RD Web Access? Browse to the .pfx file, enter its password, and check Allow the certificate..
Click Apply again. This takes another little while longer, be a slightly more patient. Last one. 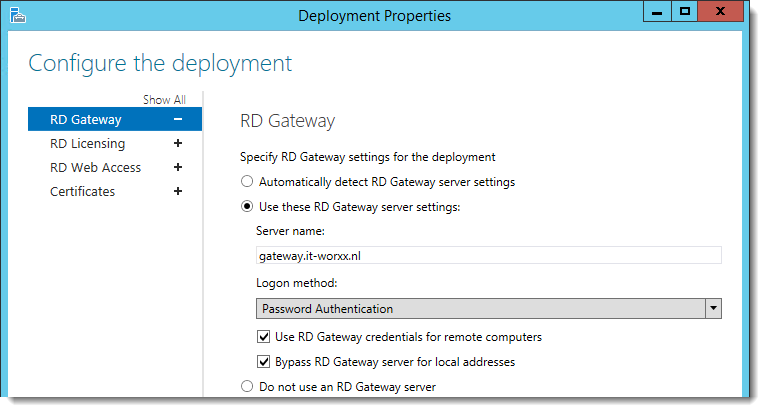 Click RD Gateway and click Select Existing certificate. Click OK to finish the certificate configuration. Configured all servers, configured certificates.. In fact you can use this setup to either provide full desktop sessions on the Session Host, or you can choose to publish only applications on the Session Host. Let’s publish full desktop sessions. User profile disks are not in focus in this guide. Since I have no file shares configured in this setup, uncheck Enable user profile disks for now. Does and Don’ts will be covered in a future post. 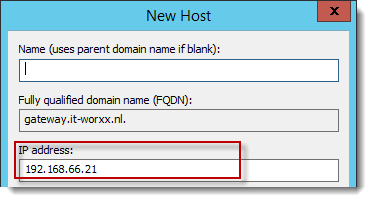 On a machine that has access to your test setup (you may have to add the external FQDN to your hosts file if you didn’t publish it to the internet) open https://gateway.it-worxx.nl/rdweb. After logging in you’re presented with the full desktop session collection we created. After clicking the Full Desktop icon you get the warning that devices are going to be redirected. In the next part of this series I will show how to extend this setup to use multiple session hosts, combine these with remote applications, and setting up dedicated servers for Web Access, Gateway and Connection Broker. but for the HA part you said (Install SQL Express on the Domain Controller) and Microsoft says it is not recommended to install SQL Express on the DC. In a production environment you would not do this indeed. I wouldn’t even use SQL Express in a production environment at all but would instead use an existing SQL server, or build one if needed. Eu aprendi contigo em 2013 quando você lançou este arquigo e continua sendo muito útil até nas versões atuais, windows 2106/2019. Parabéns pela contribuição, você acrescenta mais do que custa. I learned with you in 2013 when you released this file and it is still very useful even in the current versions, windows 2106/2019. Congratulations on the contribution, you add more than it costs. 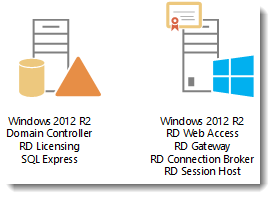 I want to deploy a RDS on one server Windows Server 2012 with SAN certificate. At the end of your tutorial “Testing the Remote Desktop Services”, what do you mean by “you may have to add the external FQDN to your hosts file if you didn’t publish it to the internet”, how to publish to the internet ? I believe what he’s saying, is that if you don’t have a public DNS ‘A record’ (e.g. 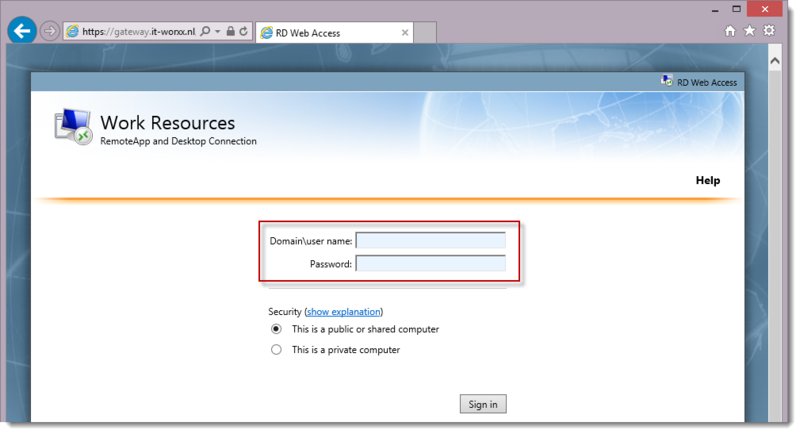 external IP address pointing to http://www.yourcompany.com), you will have to add this to your local hosts file so you can properly resolve your RD web access IIS page. Howdy! I simply want to give a huge thumbs up for the good data you’ve here on this post. I shall be coming again to your blog for more soon.